In 1999, after Hurricane Floyd's massive impact on North Carolina, North Carolina Emergency Management worked with local communities and counties to develop a new way to do business during disasters. The goal was to provide consistent training and equipment so that rescue teams could aid neighboring jurisdictions during a crisis regardless of the conditions or terrain. The result was an arsenal of consistently trained, organized search and rescue teams that could be deployed at a moment’s notice. 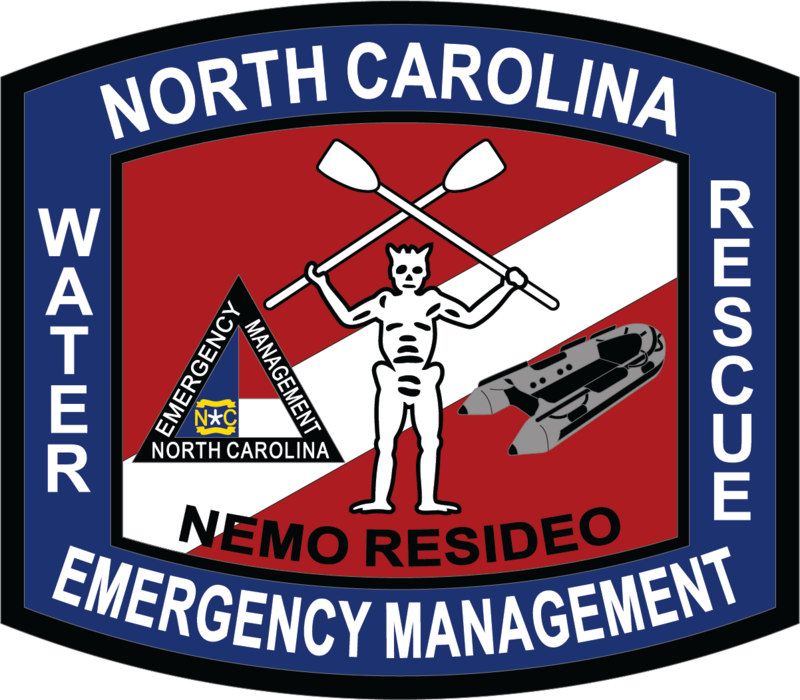 Today, there are more than 30 highly-trained swift water rescue teams positioned across the state that meet national standards and can be deployed anywhere within North Carolina or across the country. Teams can be pre-deployed with the needed resources based on the team's level of capability. During the Hurricane Matthew disaster alone, swiftwater teams pilled move than 1,800 residents from flooded vehicles and homes. Since then, NCEM has strengthened the requirements to include cross-training for a variety of flood scenarios and required the teams meet stringent national standards. 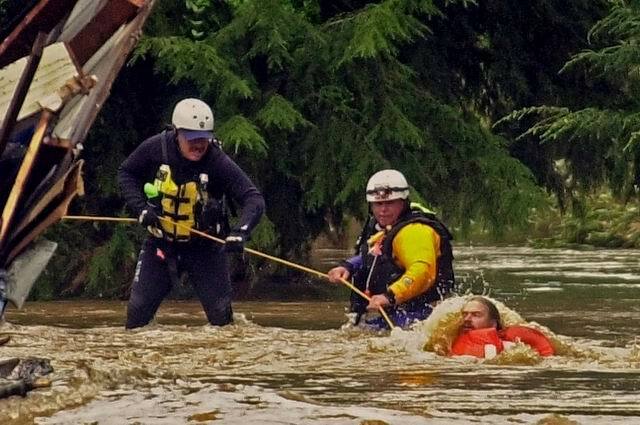 To qualify as one of the state-approved search and rescue teams, the members must demonstrate basic first responder skills then complete additional training in advanced swift water techniques. Teams are now capable of a variety of rescues from using small vessels to rescue residents from flooded homes to those outfitted with motorized, inflatable boats that can save people stranded by rising floodwaters in precarious locations. The teams routinely rescue stranded boaters, kayakers and canoers who dare to paddle on dangerous, swollen rivers. 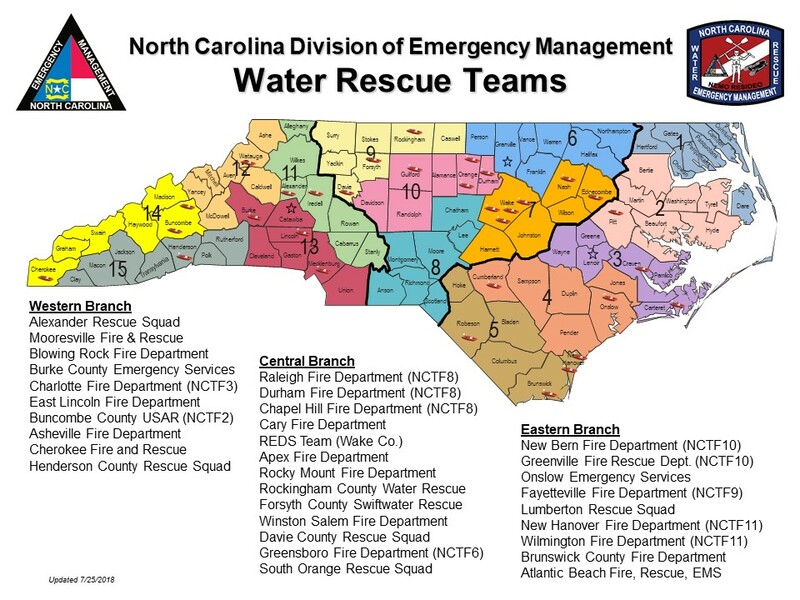 N orth Carolina has many Swiftwater/Flood Rescue teams strategically positioned across the stateand ready to deploy when needed. Technicians are trained and equipped to properly respond to flood emergencies and teams can be pre-deployed as needed. Many of the technicians also are qualified in helo-aqautic rescues to help people stranded by floodwaters on the edge of a cliff.